My working process stems from a curiosity about the strangeness of the everyday. It is this search for an unfamiliar view of the familiar that led me to abstraction, and more specifically to the abstraction of the human body. An abstract form traps the viewer in the liminal state between knowing and not knowing. Because the object cannot be named or defined in a traditional sense, the viewer must continually look back to the object for clues of its intended function and meaning. For as long as I can remember, graphic descriptions of surgeries and illness were commonplace in my house. My mother’s background in nursing, and her familiarity with parts of the body usually hidden from view or nestled beneath the skin sparked and fueled my interest in anatomy from a very young age. These discussions gave birth to countless questions about how disease and injury change the internal working of the body. Illness can transform our bodies from elegant to awkward, from efficient to non-functional, from calm to tense. I combine abstracted images of the body with forms that reference tools, machines and industry. These juxtapositions begin to question humankind’s relationship to the scientific and mechanical world. 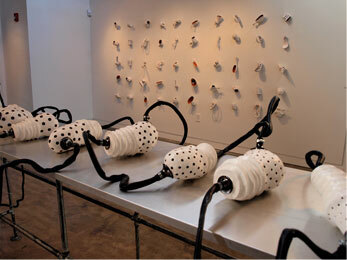 My sculptures explore working systems of the body. Air, fluids and information move in and out of organs designed for specific functions. Movement through a form is guided by passageways, openings, and caverns. Flow is implied by shape. An increase in volume can reveal a hidden growth within. A wrinkle or ridge hints at potential for expansion. My working process is one of unrestrained making. The immediacy of clay allows me to work very intuitively, often beginning a piece with only the vaguest notions of scale, shape and orientation. The studio becomes not only a physical place, but also a psychological arena. It is where I gather my thought and develop my ideas as well as the place where tangible making occurs. The process of creating is a way of marking and recording time, similar to a diary, only less linear and less specific. It is an opportunity for experimentation and risk-taking, and most importantly, a way to access and make tangible non-verbal thoughts.